Women's AFL: Who are the marquee players? 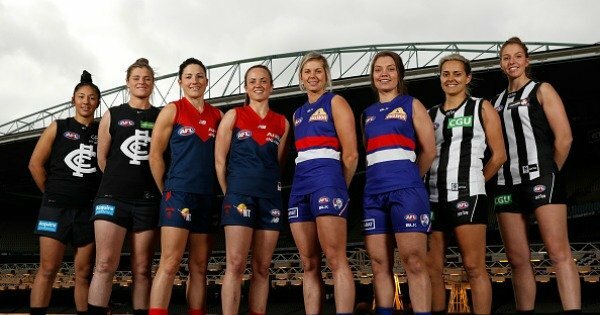 The new AFL women’s league has announced 16 marquee players for its inaugural season in 2017. The players will be paid $25,000 each and their relocation costs by the eight clubs involved in the ground-breaking competition. Background: Described as the most decorated, and highest-profile, player in the game, Pearce currently works for the Melbourne Football Club and was a trailblazer in the early exhibition matches for the Demons. She has played for Victorian powerhouse Darebin Falcons for more than a decade. Pearce said she felt fortunate the women&apos;s league was being formed while she was still young enough to be selected. "I have played for a long time and I guess people say you sort of make sacrifices, but when you&apos;re doing something that you love it&apos;s not really a sacrifice." Background: A triple premiership player with Darebin, Vescio started playing football at the age of five. Already employed by the Blues as a graphic designer, her pace and strong attack at the ball, clean hands and accurate kicking makes her one of the best fowards in the game. Vescio said she was proud to be named a marquee player. "We&apos;ve all been playing for years just purely for the love of it and just to become better footy players so to have an opportunity to enter an elite kind of environment is awesome." Background: Hope started playing football when she was 13 and has regularly topped the VWFL goal kicking while playing with the St Kilda Sharks. Lively and highly skilled, Hope is as good on the ground as she is in the air. Hope said she stepped away from the game to focus on her career, but was inspired to return to the field after watching a women&apos;s exhibition game. "I just love it. I have footballs everywhere in my house, anytime I get a chance to have a kick, I&apos;ll kick." Background: Nicknamed "Juddy" after retired midfield superstar Chris Judd, West Australian midfielder Kara Donnellan has been described by Dockers coach Michelle Cowan as an exceptional and versatile athlete. Donnellan said signing for Fremantle for the inaugural season of the competition was a dream come true. "I&apos;ve been dreaming of this since I was a little girl. Didn&apos;t think it would ever happen." Background: Queensland born and bred, Harris soared into the spotlight after taking a spectacular mark as a 17-year-old during and exhibition match and is a five-time youth All-Australian. She is known for her attack at the contest, elite marking and defensive pressure. Background: Randall grew up playing against the boys in regional WA and has twice won the best and fairest in the WA Women&apos;s Football League (WAWFL). Known for hitting the contest hard and her exceptional skills, she is said to be one who does not shy away from the contest. "I dreamed of playing AFL and one day someone actually told me that I was a girl and I wasn&apos;t actually able to make it to the AFL, so my dreams got crushed pretty quickly." Background: An electrician by day, "Sparky" is a hard-running midfielder who knows how to find the footy. The captain of the Coastal Titans in the WAWFL, Forth is considered to be the ultimate professional and a great role model for younger players. Background: One of the established stars of women&apos;s footy, Brennan played in three flags with Darebin after moving from Queensland. The strength and conditioning coach is known for her strong hands and massive engine, and her elite preparation off the field. This story originally appeared on ABC News.